Review written by Jocelyn Koehler. 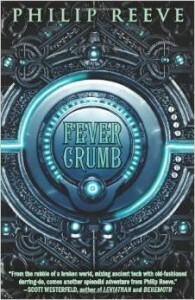 Fever Crumb takes place in the grim darkness of the future (about the year 3030), where the city of London endures by scavenging the relics of long ago ages: plastic chunks and computer motherboards. Some old knowledge is preserved, but in a warped form. The main character, Fever Crumb, is a foundling, raised by the Order of Engineers, a group of men who avoid emotion and cling to reason. She is the only girl in the Order, and one day she is requested to join an archeological dig run by a man named Kit Solent. Solent asks for Fever particularly, and as she goes though the dig, she experiences memories that aren’t hers. Impossibly, they seem to be the memories of the previous ruler of London, the last of a cruel race known as the Scriven, who was assassinated 14 years previously in the riots that ended Scriven rule. Political events both within and outside of the city interrupt the dig, and Fever must go on the run when she is mistaken for a Scriven herself. The mystery of her parentage and the future of the city are linked, but very few people are willing to tell young Fever the truth. This steampunky, futuristic story is the first in a trilogy. It reminded me a bit of Philip Pullman’s The Golden Compass , though without the religious/cosmic elements. The level of violence in the story makes it a book for older readers (the humor is also pretty sophisticated). The teenaged Fever is described as rational (considered unusual for a woman in this world), intelligent, and with looks that “bypassed pretty and went straight into beautiful.” She shaves her head, in Engineer style. She has the oft-parodied YA heroine defect-that-isn’t-really-a-defect of possessing eyes of two different colors. In the book, this “flaw” makes people wary of her, but it in no way harms her self-esteem. Her smarts and skills as an engineer are useful throughout the book, and her looks don’t seem to have a huge effect on her life, primarily because she was so sheltered growing up among Engineers, who make an effort to ignore “irrational” things like beauty and emotions. Fever is raised “rationally” by the engineer Dr. Crumb. 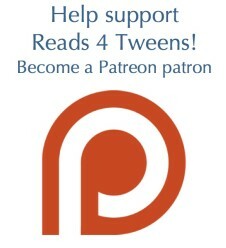 At the beginning, he is open about her being an orphan and him being her foster father. But later, it is revealed that he is in fact Fever’s birth father, and that her mother Wavey Godshawk is Scriven (a mutant race), as well as the daughter of Lord Godshawk, the last Scriven ruler. Fever has to deal with the fact that her guardian lied to her, that she is mixed-race, and that her mother may or may not be alive…all within a day or two. It’s a major part of the plot and very intense. At the end of the book, Fever deliberately chooses to not search for her mother or father, but rather to go off on her own for a while to figure things out, which sounds very mature/independent on her part, especially as she has two more orphaned kids in tow. Fever’s mother gives her up to be cared for by her father, because she fears her life will be too dangerous for a baby. Dr. Crumb cares for her, but does lie to her (partly for her protection, and partly because he never knows how to tell her the truth). Another family, the Solents, is described as being more typical, with a lot of love and strong bonds, though the mother is dead by the time the book begins, and the father is dead (sort of) by the end. The young brother and sister survive to the end to join Fever on the way to the next book. There is no romantic element of the plot for Fever. One minor character thinks she’s pretty, but no one expresses any sexual interest. There is a romantic thread for Dr. Crumb and Wavey, who had a brief love affair that resulted in Wavey’s pregnancy (they’re both around 20 at the time). This story is told by Dr. Crumb fourteen years afterward, and only one kiss is shown for the reader. The couple is broken up by Wavey’s father before anyone knows about the pregnancy, and the implication is that they loved each other and the end of the affair was not their choice. The world is dark and dangerous. In the beginning of the book, Fever is sheltered from overt violence, but as soon as she starts to move past the Engineers’ property, she is threatened, stalked, nearly assassinated, and finally forced to flee the city. She is chased and shot at in one scene (the same scene in which Kit Solent is mortally wounded). She sees Kit’s dead body not long after, and then sees that body “resurrected” as a robot Stalker, though Kit’s personality is gone by that point. There is a battle for the city, as well as riots described in flashback and those occurring at the time of the story. One of the “noble” characters is a Skinner, famous for killing Scriven during the last riots. Overall, it feels like people drop dead like flies around Fever, and by the end, the mood is rather grim. 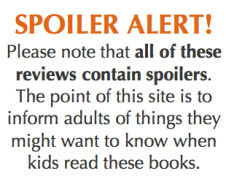 Sensitive readers will not like parts of the story, which rely heavily on the brutal reality of war for their effect. Fever is atheist, but it is made clear that most non-Engineers believe in some sort of divinity. There are many minor deities, but no obvious major religions mentioned. “Cheesers Crice” is described as “some old Cockney god,” and “Hari Potter” is another name to invoke—it’s clear that these names are altered as a way to show how much society can change, rather than just to make fun of religions. I personally didn’t find anything offensive about that, but some parents might. In the story, centuries of pollution and probably radiation have resulted in some mutated races as well as individual Misshapes. Misshapes are usually killed at birth, and are not valued at all. Most mutant races don’t seem to live very long, but the Scriven thrive for several hundred years (they basically look like humans with ink-colored marks on their skin, which they believe are put there by a god called the Scrivener). Human Londoners hate the Scriven for oppressing them for centuries. Most human Londoners also fear any foreigners, which include people from the north, gypsies, and anyone from outside the city (they are all assumed to be stupid barbarians, though events prove otherwise). The genocide of the Scriven is seen by many as justified and initially exciting. The Scriven’s distinct appearance makes it easy to declare them as “other.” It’s not quite the same as simple racism, because the prejudice is linked to the oppression by the Scriven (who did mistreat the masses for generations), but it’s fairly nasty, and a big part of the story. This is a well-written book with an unusual, strong female protagonist, and plot that revolves around the discovery of many secrets. I found the lack of romance refreshing. The setting is dark and steampunk. It’d be too intense for those who only made it through the third Harry Potter book, but fine for those who have read the final HP books. Be aware that, in addition to being the first book of a trilogy, it’s also a prequel to a series (called by various names: Hungry Cities, Predator Cities, or Mortal Engines) and feels very open-ended, even though it doesn’t end on a cliffhanger. Why Are Fairy Tales "Girl Books"? 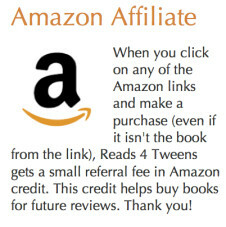 Links on this site will lead you to Amazon. If you make a purchase, I'll receive a referral fee.